Only the fifth chapter of this text still exists, but it is a wonder that anything exists at all. For this is a record of the words of the creator of this universe, Lord Brahma, spoken just after he gained enlightenment and just prior to creating our worlds. Here are my renditions of 18 verses of Brahma’s song he sang to Govinda / Krishna. In a land whose stones fulfill all desires. and always his beautiful flute. Each sense of his body can perform the action of any sense. He is forever a freshly bloomed youth. He is unlimited in time and space. Who has heartfelt love for him. Still they do not reach even the tip of his toe! He is the one the ancient Vedic hymns praise. glory, position, powers, and ornaments. with beings who emanate from him. beyond whom there is nothing more powerful. as described in the sacred Veda. This all diffuses from the outer border of his potency and power. Beyond them all, his own abode, Goloka. in accordance to his will. to act on his behalf. So all Govinda’s expansions are equally powerful as he. Govinda, the original person, I adore. I love it! 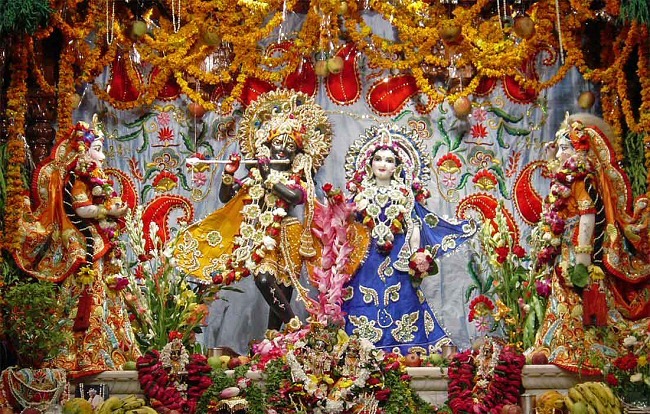 govindam âdi-purusham tam aham bhajami.